CloudLink’s powerful connection with Adobe InDesign links NetX assets to an InDesign file. Users can quickly search and filter their NetX DAM system from within InDesign. Multiple users located anywhere can easily preview and place images in their own InDesign creations while maintaining the image's URL based link. 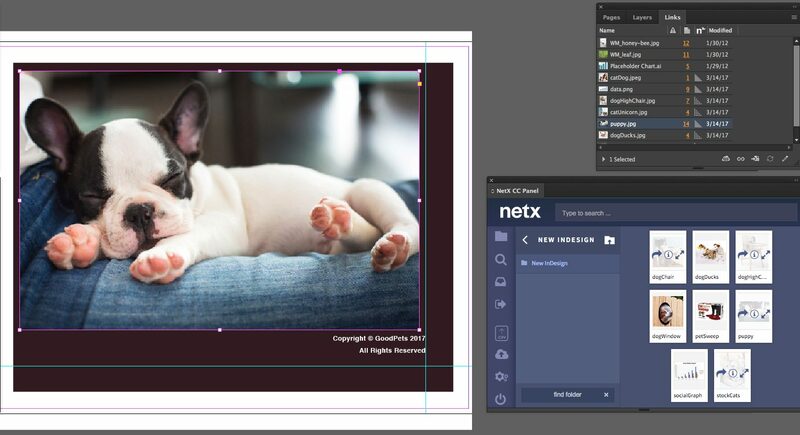 Images that are updated within NetX will notify users within InDesign, keeping brand consistent and up to date. Standard InDesign workflow involves inserting locally stored images to create your company designs.CloudLink let’s designers take advantage of their company’s DAM, no longer relying on locally stored images. InDesign respects HTTP links to remotely managed NetX assets. Designers using the CloudLink workflow will save time and space. CloudLink enables a central repository of images in the NetX Cloud, eliminating image replication in local environment. quality, security, and relevance. The simple and intuitive tool will enable designers to browse, select, and replace images from their NetX DAM with ease. Daily production and search tasks become simpler with a cloud based search engine since designers can create with confidence, knowing that their image is the relevant and approved version. Users can quickly find images using the power of their NetX DAM through search, metadata tags, saved searches, and collections. CloudLink maintains permissions for assets.This ensures that the right people get the right assets at the right time. Keep your linked images relevant with real time version updates. InDesign users will be notified any changes and can choose to update the image within InDesign. Remote, NetX based assets are placed directly into InDesign documents. Please inquire with the NetX Accounts team to learn more.